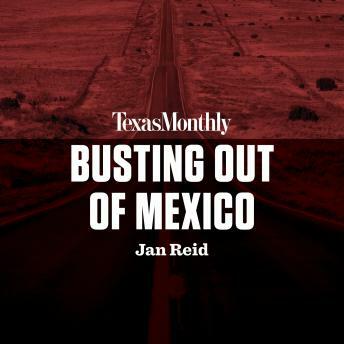 In partnership with Texas Monthly, Jan Reid's 'Busting Out of Mexico' is now available as an audio download, where the length and timeliness of a podcast meets the high-quality production of a full-length audio program. In Mexico, if violence and property damage are avoided, there is no law against breaking out of jail. When con artist Sterling Blake Davis, Sr. found himself with little to live for other than his son -- held in a Mexican, federal prison on charges of marijuana possession -- he thought, why not free him? What follows is a story typically reserved for the movies. The gang started by Davis, Sr. to free his son comprised a Vietnam veteran, trained in skills of war increasingly detestable to those around him; a down-on-his luck Texan in search of his next paycheck or, more accurately, his next adventure; and a naive kid hoping to live up to the tough crowd he ran with. Though each was hooked at the start by promise of money, by the end they would feel they were performing the work of heroes. 'Busting Out of Mexico' is the account of a jailbreak of Americans from a Mexican prison, with publicity outlandish enough to put penniless Texans on everyone's radar and legal ramifications that led all the way up to Gerald Ford's and Henry Kissinger's White House.